If my site is ranking #1 according to Ahrefs, but it's just an image from my site ranking, then I should be able to filter this out. The option should be: "Hide image-only rankings". If I rank for images and have a normal listing in the SERP, then it won't be filtered out. If I rank only for the image, then it should be filtered out. As contributed by Olaf, the same should be possible with rich snippets. There should be the ability to show only traditional rankings if that's what we want to focus on. Side note, the Ahrefs image ranking is false - any of the images are shown as #1 in Ahrefs. This is probably the most important change you can make. I have never seen a rank tracker put priority to a rich result. This current method basically makes an export, given to a client, dangerous if they have a lot of special features in the SERPs. Clients only primarily care about the blue links. And I want to be able to give them this information. Please please please make this change. I'd otherwise need to have to purchase a different rank tracker. HUGE issue. Might not keep this tool. This is huge, this issue alone makes the C-level execs I share reports to not trust the information. YES!!! The fact that this isn't in queue is ridiculous. Fix this. 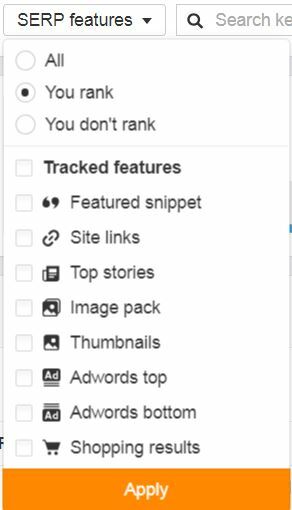 Just wondering why no more folks are complaining about the lack of filtering out image results from the ranking reports... For me, by deselecting all tracked features from the list, only web page rankings should be visible. But this is apparently not how the tool is working. Without having a possibility to get the web page rankings AHREFS will be useless for me. @Michael Jaroszewski: Yes, I agree, it's trash and fake data! @Hofit Mallachy: I agree that it's a HUGE ERROR that needs to be fixed since it's showing FALSE INFO. @Joseph Robison Hi Joseph. I voted for this feature but to help us get more votes I think you should change the title to be able to filter featured snippets in general out of the ranking. I tried to find this topic but took me a long time that's why I am suggesting this. @Olaf van Gessel: Thanks for the vote and the tip. I edited the title to include rich snippets, while keeping the original sentiment. Let me know if that reads clearer and includes what you were thinking? @Joseph Robison: Thx for getting back to me. I would suggest: Should be able to filter out image results (or other rich snippets) from the rankings. Because also if you would have more results and the featured snippet is the highest that can be confusing. I'd like the possibility to see only the organic "normal/old" ranking if i wanted to. I spent agonizing HOURS this week talking to Helen on Customer Support about this. 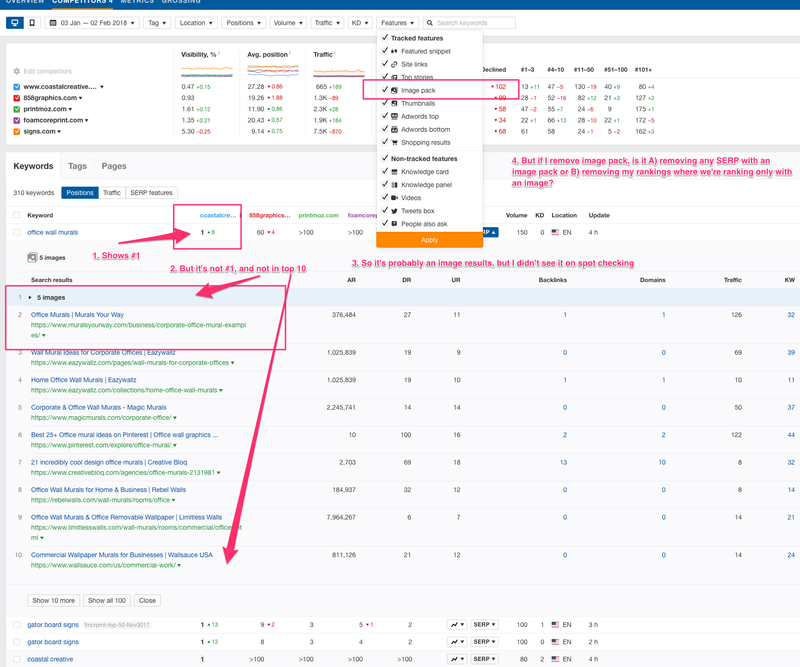 This issue makes Ahrefs RankTracker far less useful to us, because it screws up the Positions, to where we can't really trust it without doing a lot of manual work to "fix" it. This isn't just a problem of lack of accuracy, it's just "bad" design/decision of what to call #1. A page is NOT #1 just because it's on the image pack. Please, please fix. @Marcio Souza: Hi Marcio. Please +1 then. I agree with you totally (and with Joseph of course ;-)). But we need votes! @Marcio Souza: Yes, give us a vote!